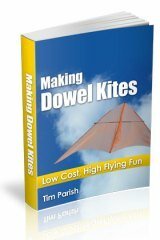 How To Make Soft Kites - Easily And Very Cheaply! Plastic And Tape - That's It! 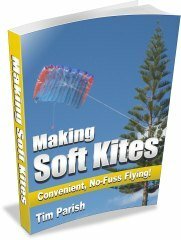 If you want to know how to make soft kites, you have come to a good place. MBK Soft Sled instructions are right here, linked from this page. Also, except for the Soft Sled, there's an e-book for each individual design. You will know exactly what to expect from the e-books, having made the Soft Sled from my on-line instructions! Same standard, same style. These designs are not as quick and simple to make as the Simple Series kites elsewhere on this site. However, they have the considerable advantage of not requiring any rigid spar material. There's a photo of each one, further down this page. No sticks or rods made from dowel, bamboo, fiberglass, carbon or anything else need to be found. 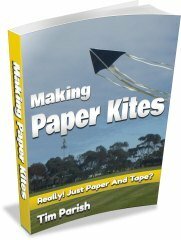 In fact, it's quite possible that enough tape and plastic is already sitting in cupboards around your house to make a high-flying kite. Or three! MBK Octopus - yes, a genuine inflatable octopus, writhing tubular tails and all! Each section below is dedicated to one soft kite design. 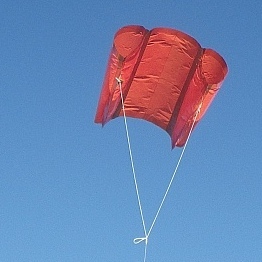 First comes the Soft Sled, with a link to the free step-by-step instructions for that kite. Next come the paid e-book designs, with links for secure on-line purchase. For each design there is (or soon will be) a link to a Flight Report. 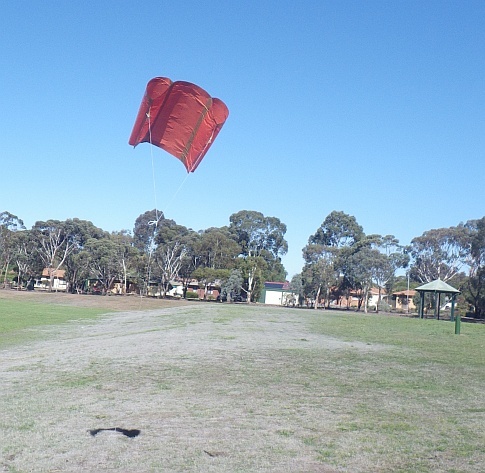 That page includes a video and several large photos of the original kite doing it's thing. I have tried to be generous in my estimates of construction time, below. You might do them quicker! Construction time: around 3 hours. This design was inspired by the classic Pocket Sled, but has several small differences. Not to mention some large ones - the different scale, materials and construction methods. Here are the free step-by-step instructions. Read about this kite's first flights. The photos and video in there were taken on the day. Check them out! Construction time: around 6 hours. You know, those huge parachute-like things which haul tourists off beaches and into the air behind a speed-boat... Now you will be able to make a much smaller version and fly it like a kite! Here's the e-book of step-by-step instructions. Read about the Parasail flying over beach sand. 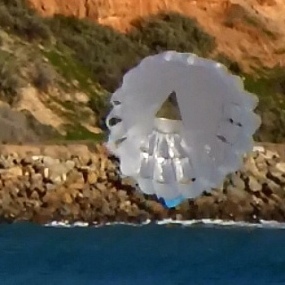 See this kite from various angles in the video and large photos in there. Construction time: around 5 hours. Everybody's seen a parafoil these days. No rigid spars, just squarish cells of cloth, open at the front and closed at the back. Recall your last visit to a kite festival, if you've been to one. I'll bet there were parafoils everywhere, big and small. My design is toward the small end of the size range, but it is still a genuine flat parafoil kite. Testing has confirmed that this MBK version has a very useful wind range. That is, the range of wind speeds in which the kite will stay up. So there shouldn't be too many days on which you can't fly. 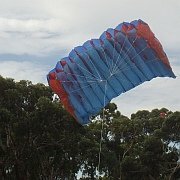 Read about the Parafoil flying in light winds. Finally, after more fiddling about with the size and shape of it's keels, number 3 started flying 'like a bought one'! Read about the Parafoil riding gusty moderate winds. There's a video and 3 big Gallery photos with each of those last 2 links. Construction time: around 11 hours. 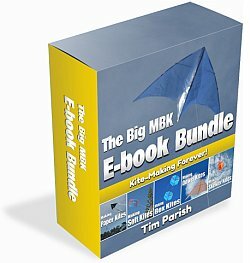 This MBK kite is able to handle quite fresh breezes. So keep it handy for when your other kites give up and start looping around or going way over to one side. Useful! 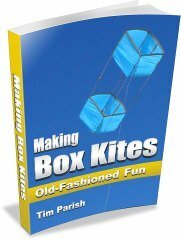 And of course no rigging to do, compared to say, a box kite. As with some of my other soft designs, the first 2 prototypes weren't particularly satisfactory. 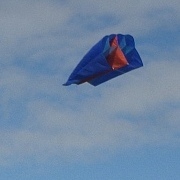 The main issue was getting the bridling right so the kite would stay inflated and fly stable. Finally, good flying characteristics were achieved. The little foil turned out to have a great wind range. 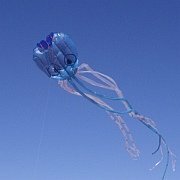 Read about the Parachute kite flying over rocks, in a Light to Gentle strength breeze near the surf. Plus see video and big Gallery photos taken on the day. Construction time: around 14 hours. If you have ever been to a large kite festival, it's almost certain that a large Octopus would have taken to the sky at some point. The MBK version is of course a lot smaller - but retains much of the attraction of it's huge cousins! Once it's up, the MBK octopus is quite steady in the air and doesn't pull too hard. An older kid would be able to stay in control, even in moderate winds. People walking past will gawk at the wide-eyed creature with flowing flailing tentacles. Guaranteed! It's a definite head-turner, this kite. As usual, 3 prototypes were required - and the bridle was re-done on the last one as well. Designing soft kites is not for the impatient. Read about when this Octopus was boxed in at the beach, flying high under an overcast sky. There'a video and 6 huge Gallery photos in there too. I've noticed that experienced kite fliers often gravitate towards soft designs. Often very large and expensive ones, but that's not where we're at here. Anyway - soft kites, pound for pound or kilo for kilo, are just less work out on the flying field! 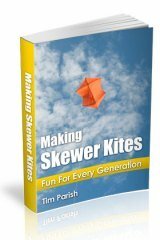 Using my publications on how to make soft kites should be fun for just about any age group. Having said that, I might eventually include hints and tips for scaling the designs either up or down. So, tiny kites for tiny tot kite enthusiasts and huge ones for Serious Kite Fliers.